Fears have been growing over a spike in farm fires after official figures confirmed claim costs were rising at a time when Fire Service response times were getting slower. NFU Mutual’s latest statistics revealed a sharp rise of 26 per cent to £44 million last year, with the east and south east of England suffering hits of more than £10m each. In the majority, electrical faults were the main cause, with arson a close second. 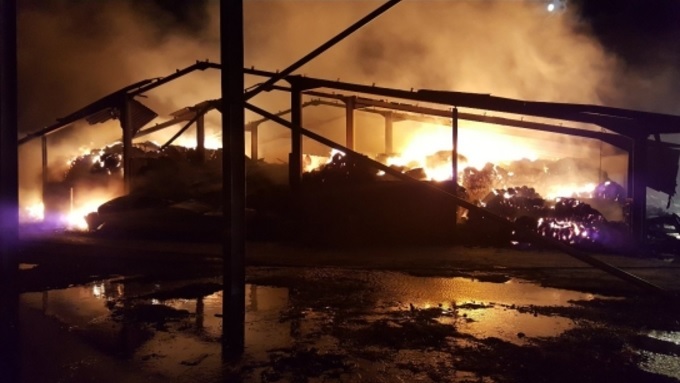 Retford contractor Henry Rowarth, who contracts in North Nottinghamshire and Lincolnshire, said the figures came as no surprise and warned rural fires were becoming ‘a very sad reality’. One particular spout of arson set him back 6,500 straw bales on August 31, just weeks before another suspected arson attack engulfed hundreds of bales he contracted just off the side of the A1, about three miles away from the first. Mr Rowarth said: “It was horrendous. The first was a fire that started with two stacks, which lit the next, which lit the next. It came as Government statistics for England highlighted fire and rescue service incident response times in rural areas increased almost 10 per cent, by 48 seconds, to nine minutes and 45 seconds in 2015/16 compared to seven minutes and 46 seconds in urban areas. Tim Price, NFU Mutual rural affairs specialist, said: “People in the countryside are concerned by longer fire service response times in very rural locations. Official Government fire statistics confirmed 574 fires on agricultural premises in 2015/16, with 152 reported as deliberate, compared to 532 rural fires in 2014/15.